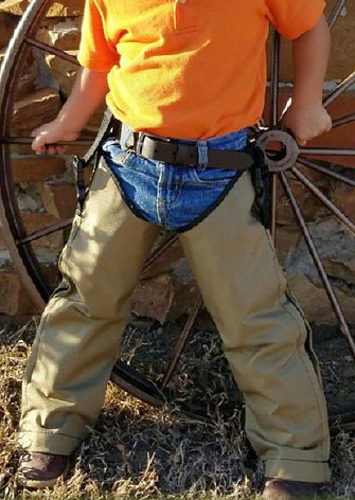 If you're wearing snake chaps to protect against deadly rattlesnakes and other vipers, you'll definitely want your kids to wear them, too, while camping, fishing, hunting, or simply working in your backyard clearing brush or mowing. If you're in snake country, protection your entire family! Youth snake chapz offers 100% full protection from the ankle all the way to the thigh, with comfortable knee movement. Penetration tested to ASTM-1342-05 standards. Childrens snake chaps are sized by measuring around the largest part of his/her calf and thigh while wearing the same type of pants he/she would wear outdoors. See sizing chart. Just like adults who wear snake chaps, children should wear sturdy boots or thick shoes so snake fangs cannot penetrate foot area. Available in 8 sizes and 2 colors.